Laine ripping it up with Little and Connor at 5-on-5 - The Point Data-driven hockey storytelling that gets right to the point. Patrik Laine’s been on an absolute tear in his last 5 games, scoring 11 goals and 1 assist for 12 points. Coincidentally, he started getting hot the same night he started playing with Kyle Connor and Bryan Little. 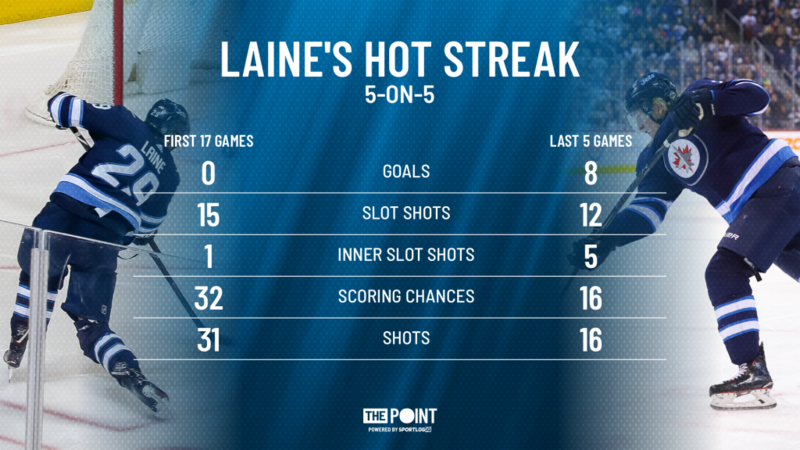 What really stands out in Laine’s hot streak is his 9 even-strength goals, compared to 1 even-strength goal he scored in the 17 games prior. That one goal also happened to be an empty-netter. So what’s been different about his game? Well, he’s finally getting open looks in-tight. In his last 5 games, Laine is averaging more shots per game at 5-on-5 than he was earlier in the season and he’s getting more shots from more dangerous areas. Laine has 5 inner slot shots in his last 5 games and 4 of them have found the back of the net. In his first 17 games, Laine had just 1 shot from the inner slot at 5-on-5. The inner slot is the most high-danger area on the ice and even comparable scorers like Alex Ovechkin and Steven Stamkos generate a good amount of their 5-on-5 goals from here. Laine isn’t a guy who is going to retrieve a lot of pucks and Connor and Little have done a terrific job of setting him up in prime scoring areas. Their frenzied attack on the opposing team lets Laine slip in-and-out of the quiet areas where he can be his most dangerous. Laine has been one of the league’s most prolific goal scorers since his rookie season. His 99 goals in that time are second in the league and he’s been able to do it both on the power play and at even-strength, ranking 2nd on the man advantage and tied for 4th at even-strength. Finding his goal touch at even-strength is exactly what the Jets need in a very strong Central Division and he’s certainly done that as of late.